Hi there! 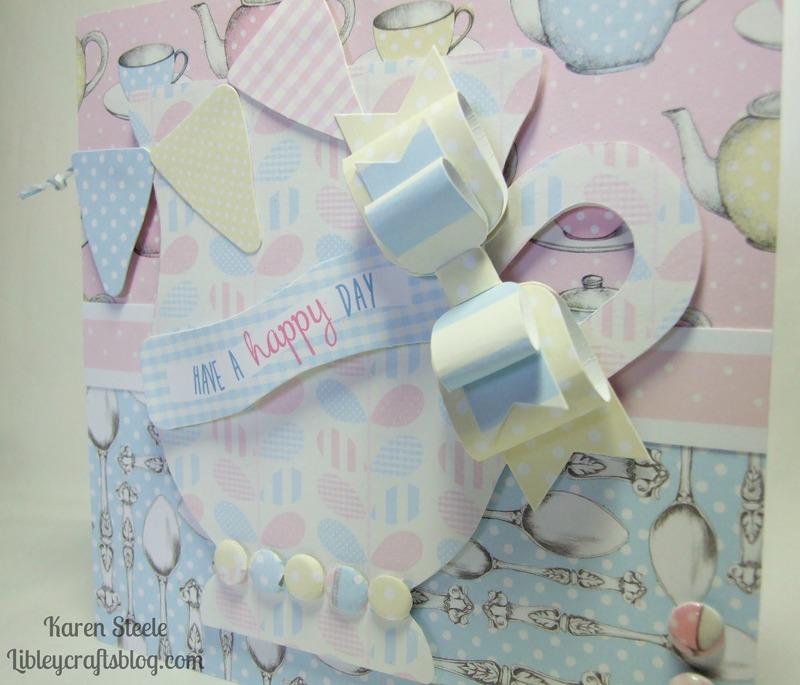 Today I’m back with a card that I have made using another set from Craftwork Cards called Bohemian Dreams. The colours are very rich and vibrant and the papers include lots of spots and checks which I love. This card was made for my sister to give to her Mother-in-Law. Everything that I have used here is from this collection apart from the bow which I made using a die by L’il Inker, the tag is from Spellbinders and the sentiment is a mix of Mama Elephants Mini Messages and a set from Clearly Besotted which they have now retired. Hello there craft fans! It’s Monday – again!- so I’m here today with this card that I made for my sister’s friend who has a motorhome! However, I’m pretty sure that her motorhome doesn’t look anywhere as pretty as these two campers:-) I love the colour palette of this set from Craftwork Cards which is called Seaside Summer. All the die-cuts, frame, candi and papers are part of the collection which unfortunately isn’t available from them anymore but I have seen it around on-line to purchase. The only other item that I have used here is the Camellia Die from Sue Wilson. That’s all from me for today. The children are back at school after their half-term break so now it’s the last stretch until the start of the summer hols – hurrah! Oooh, if only we had a campervan to go off in…..
For this card I also used Craftwork Cards Card Candi, twine, Spellbinders tag die and the sentiment was created on the computer. Hi there! Today I’m sharing this card that I made for a friend of my Dad’s who recently suffered a stroke. I have also used this image for my Father-in-Law who was rushed into hospital last month. I’m pleased to say they are both doing really well and are now on the road to recovery. ‘Get Well’ cards are hopefully not one’s that we need to send a lot of but when we do isn’t this a fabulous image to use?! It’s called Feel Better Birdbrain and is available at From the Heart Stamps. 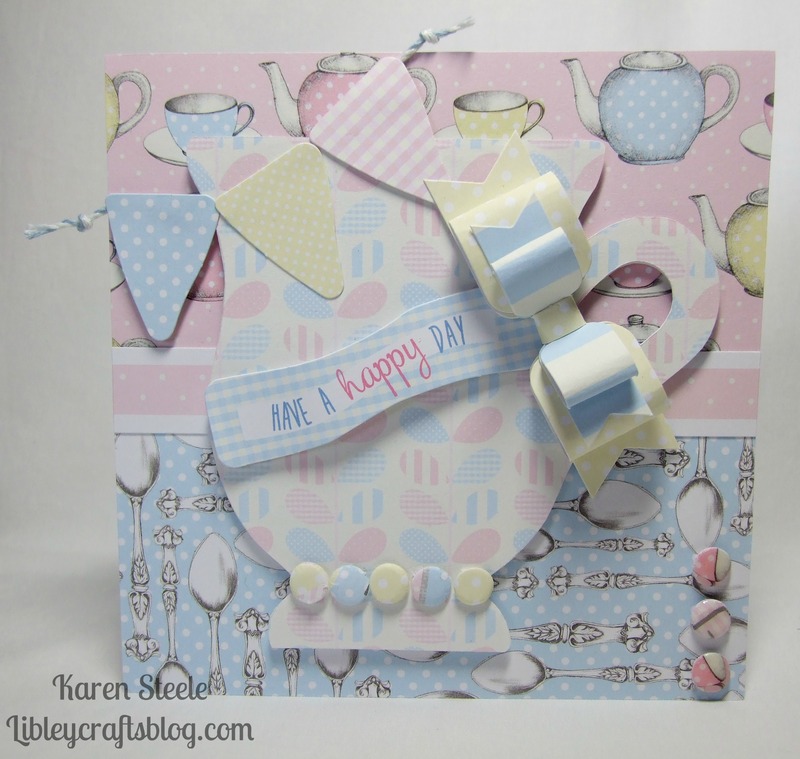 I used a Craftwork Cards sentiment with this one but you get a great selection in the set and here it is! There are some great new digital images in the store so it’s well worth having a little peek, and of course the lovely ladies on the DT always provide great inspiration on the BLOG. I also used Spellbinders Square Dies, Spectrum Noirs, an epoxy sticker and the papers are from My Mind’s Eye – ‘Kate & Co’ Oxford Lane. 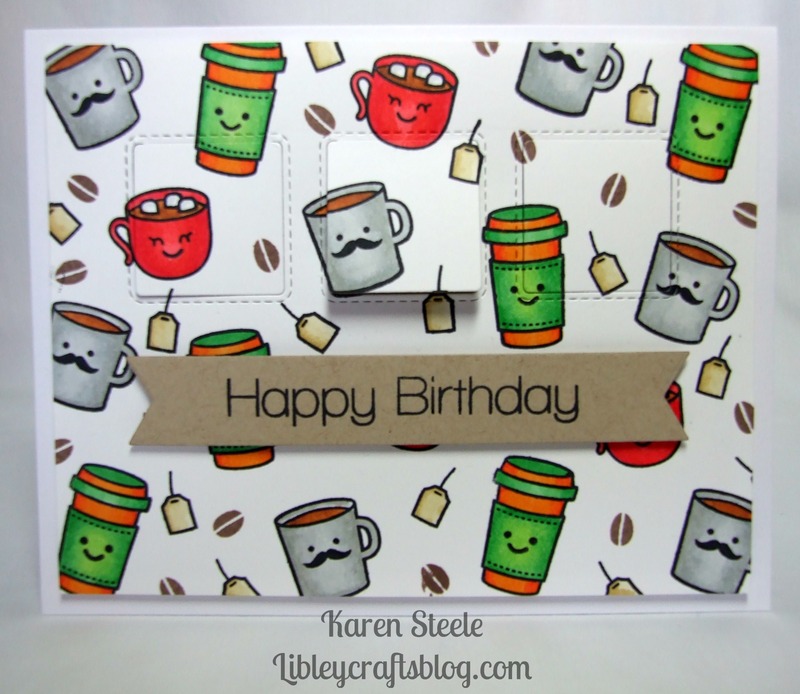 I am entering this in the new weekly Sketch challenge at From the Heart Stamps where the twist is to use a die-cut and here’s the sketch if you want to play along too! Challenge rules can be found HERE but everyone who enters gets $1 credit for the store! Hi there! 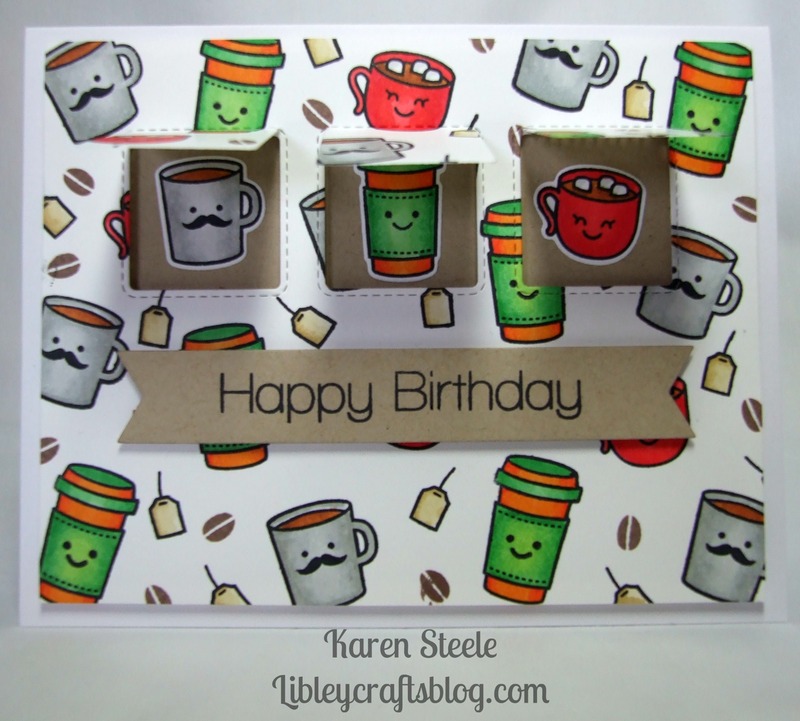 I hope you’re well and looking forward to the weekend – not long to go now 🙂 Today I’m sharing a birthday card that I made for my sister to give to her friend last month using Craftwork Cards ‘Fancy a Cuppa Collection’. I don’t think that this collection is still available from them as I had this last year some time but I just love the papers and pastel colour palette here. Everything here is Craftwork cards apart from the tiny bits of twine that I used at the ends of the bunting. My sister and her friend like to catch-up over a cup of tea/coffee so I thought this was rather an apt choice of card!